Mother’s Day is almost here. With less than one week until the annual day of motherly celebrations, last-minute shoppers are wracking their brains to find the perfect gifts for Mom. Believe it or not, this is an opportune time to kick promotions up a notch. 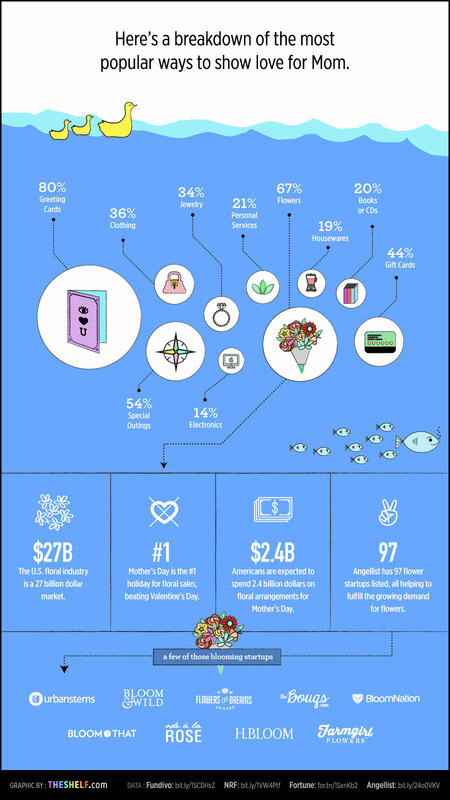 84 percent of people celebrate Mother’s Day, yet a whopping 48 percent of people don’t shop for mom until the last week or few days leading up to the holiday. Mother’s Day is considered the third biggest retail holiday of the year, exceeded only by back-to-school and winter holidays, yet many brands still don’t see how huge the opportunity is, especially when it comes to kicking promotions up a notch for that last-minute rush. Spending has reached an all-time high at $21.2B in the United States, meaning there are plenty of gift-givers whose attention you can catch in their quest to find the perfect gifts for that special woman in their lives. 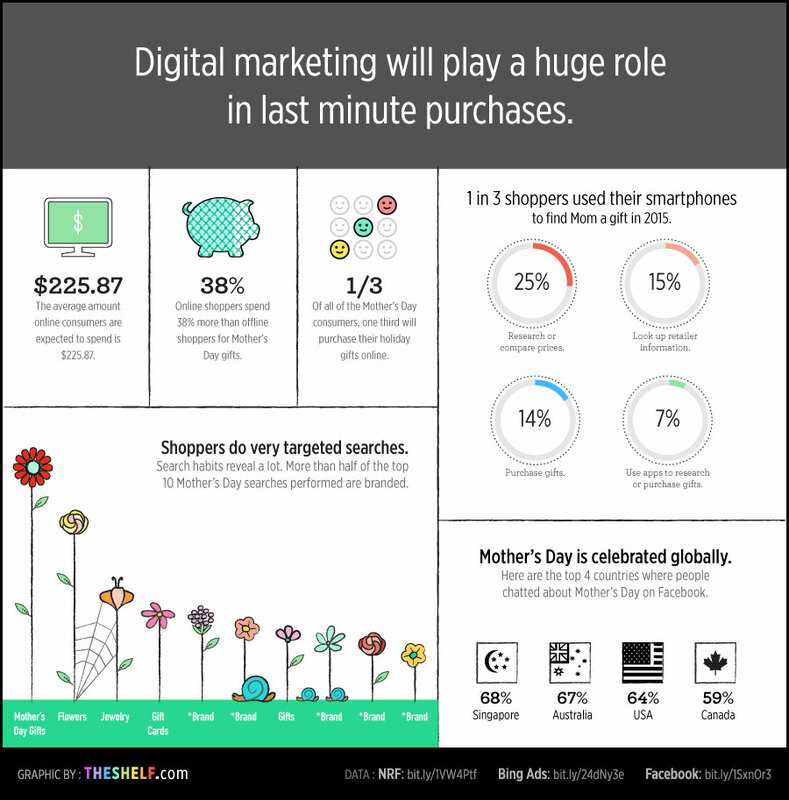 Digital shoppers spend 38 percent more than the average shopper on Mother’s Day gifts, rolling in at $225.87 on average per shopper. It seems like Mom has just about everything she already needs, so the breakdown of gifts isn’t so surprising. The most popular ways to show love for mom are greeting cards, flowers, special outings, gift cards, clothing, jewellery, personal services, books/CDs, housewares, and electronics. The United States floral industry is a 27 billion dollar market, and Mother’s Day is the number one holiday for floral sales, even beating out the annual day of love, Valentine’s Day. But even if you don’t sell typical Mother’s Day products, this doesn’t mean you can’t capture the attention of gift-givers as they rampantly research what to get mom. Here are five ways you can get in front of procrastinators just in time for them to show their love for mom. In a perfect world, we’d all have our Mother’s Day gifts prepped weeks in advance. In reality, the majority don’t start their research until one week beforehand. And for those that don’t go all out, floral sales are huge on the day of Mother’s Day. If you sell anything gift-worthy, you should be sending out promotions right before the big day. Think guaranteed delivery and gift cards. A rushed shopper will gladly pay the price for their lack of planning! The final week is when shoppers start to get real about Mother’s Day. In fact, clicks don’t start coming in until the final week or days leading up to the holiday, so reserve enough budget for that final gift-giving push. Remember that shoppers are buying gifts for more than just their moms, so you need to think laterally about relationships. Target keywords like “stepmoms,” “grandmothers,” “aunts,” “sisters,” “wives,” “friends,” and “daughters.” Calling out brand names in copy is a big driver of clicks, too. In 2015, over a third of shoppers used their mobile phones to find mom a gift. The majority do so to research and compare prices, but many shoppers look for retailer information. Make sure your contact information is up to date in case shoppers need to locate your store or reach out with questions. 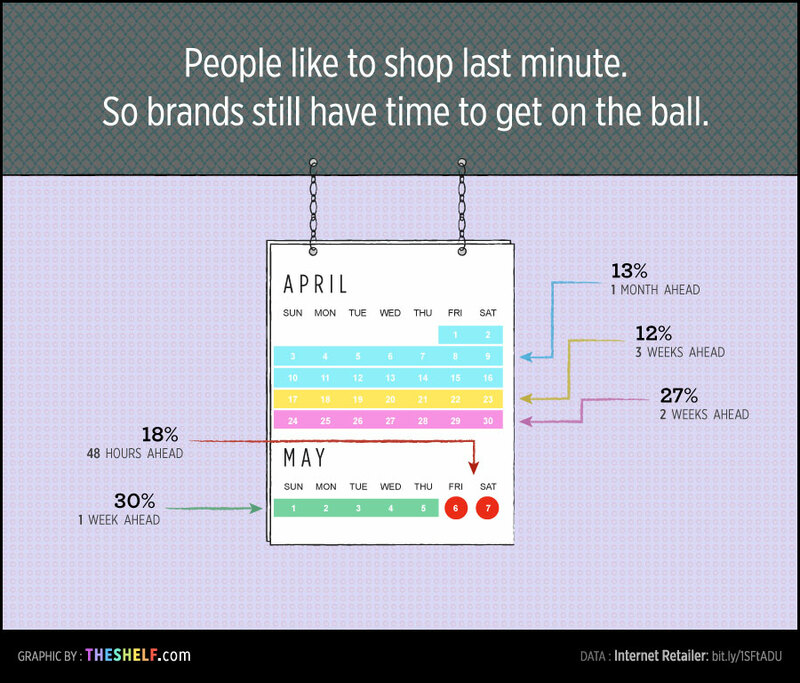 Since 14 percent will be purchasing gifts right from their smartphones, make the shopping experience seamless. These people are looking for an easy way to ensure mom gets her gift in time, and you’re the answer to their problems. Also, ensure you’re reaching the right audience by including Mother’s Day-specific CTAs on your homepage. Mobile conversions will be much better! Nothing is more powerful than trust. And since trust is an influencers’ currency, they have a leg up when it comes to Mother’s Day suggestions. Enlist relevant influencers to share their favorite last-minute gift picks from your brand right on their social channels, primarily Instagram. Stand-alone Instagram posts are a fast and easy way to capture the attention of people seeking inspiration. Sometimes your customers are in the best position to sell your products for you. Feature UGC from your customers directly on your social media channels, where shoppers are most likely to see it. UGC is highly effective because it allows people to see your product in context, which is far more relatable than your typical product shots. Provide customers with a branded hashtag right on your Instagram profile, so you can easily locate any content that people have published about your brand. 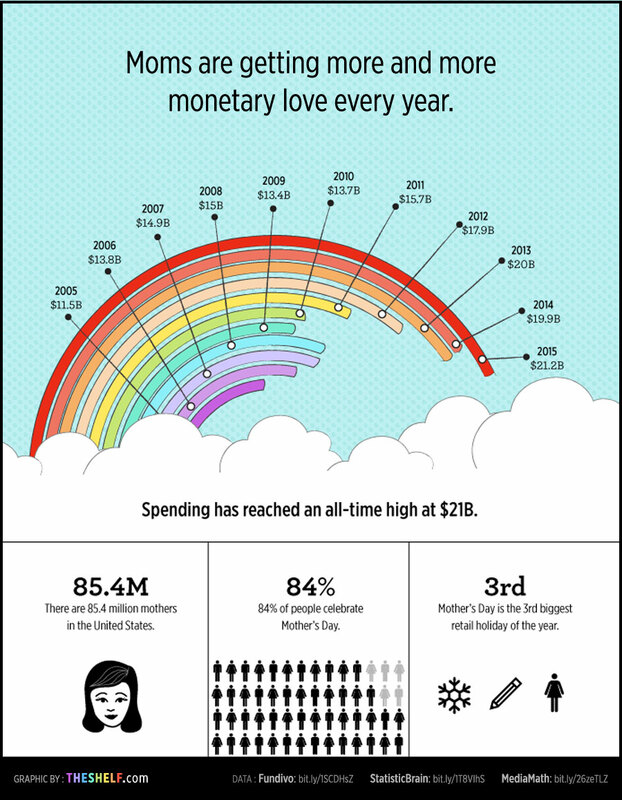 Read on for more Mother’s Day insights and how we show our love for mom in this infographic by The Shelf. Sabrina is the Marketing Manager for The Shelf, an influencer marketing platform that enables brands and agencies to connect with the most relevant influencers. They currently serve businesses in the fashion, beauty, lifestyle, travel, food and family space. She's also the co-creator of fashion blog, StreetScoutMe.